Farm Kienzlhof is located directly under the Seiser Alm mountain area in a wonderful and peaceful position in Tiosels, together with other farms just outside the village of Kastelruth. The farm is on 1150 m above sea level. From there you can enjoy a beautiful view on Kastelruth, Ritten and the surrounding panorama with the beautiful Schlern massive. Thanks to the distance from the village you will be far away from traffic, confusion and hectic places. Family Karbon will welcome you in this beautiful scenery that will make your farm holidays really unforgettable. Our activity has a long tradition and has already been since 200 years family-run. Farm Kienzlhof is a lively and family-friendly activity. Besides 13 cows and calves there are also pigs, goats, bunnies and cats. Our guests, children as well as parents, can touch and stroke each animal as well as participate to the daily works in the farm to know everything about how does agriculture work in South Tyrol. Outside the house there is a playground with all the necessary to have fun during sunny days: slide, swing, see-saw, sandbox, tractors for children, who can play also table tennis and basket ball. Just 200 m away from our farm there is a football pitch, whereas our lawn for sunbathing is ideal for those in search for relaxation. 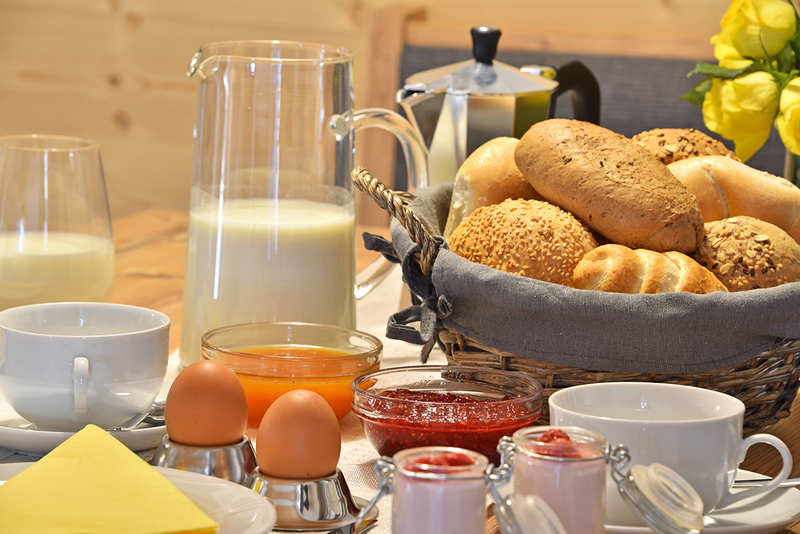 As Kienzlhof’s guest you can try immediately our homemade products. For breakfast we offer fresh milk and eggs. Thanks to our special bread service every morning you can choose between various types of bread covered by delicious crunchy seeds. Besides this juices and jams produced at Kienzlhof. In our herbs garden you will find fresh and aromatic herbs, ideal to season the dishes you prepare at home.